nopStation is going to arrange a nopCommerce developers meetup in Bangladesh for the first time ever. 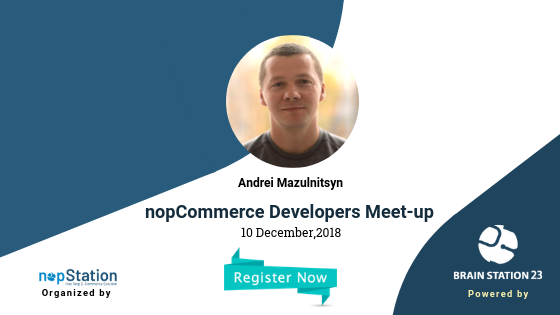 nopCommerce founder and CEO Andrei Mazulnitsyn will be joining in the meetup. This will be a warm evening where nop experts can share their favorite nopCommerce success stories and learn from fellow nopCommerce Developers. This event is truly an unique opportunity to pick up new skills, network with nopCommerce developers and absorb great insights from other tech peoples. CLICK HERE to register. As seats are limited, we’ll be able to allocate the seats as first registered first serve basis.